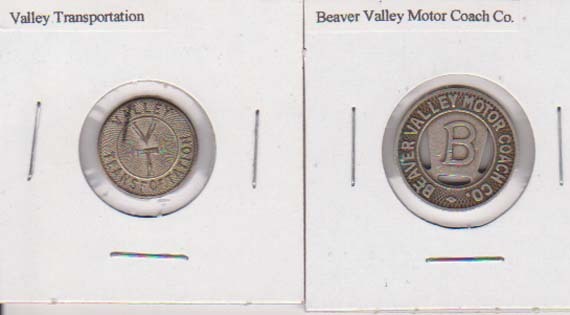 The Glasgow Railroad was incorporated on November 12, 1900, in the state of Pennsylvania. Eight years would pass before it was built. Marked on maps as an "electric coal road," the Tine ran from the powerhouse of the East Liverpool Traction and Light on River Road north to the company owned Island Run coal tipple. The company tine operated less than ten years. The Steubenville and East Liverpool Railway, however, acquired the Glasgow Railroad in 1908 when the Tripartite built the Ohio River Passenger Railway to Beaver, Pennsylvania. The ELT&L operated the coal branch. 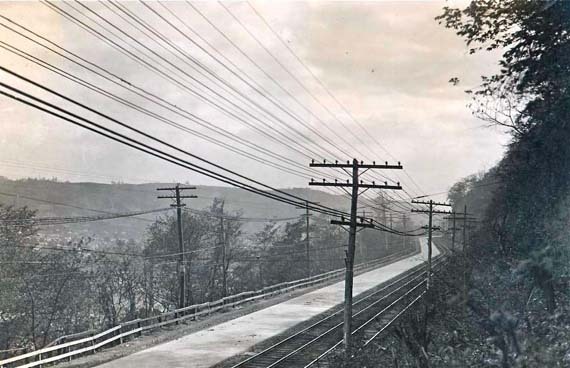 The electric coal road connected to the main line at the State Line substation, traversed the main line to Mulberry Junction, and then continued south to the power plant along the Ohio River on River Road. Ghost Rails III Electrics by Wayne A. Cole. p 179. The coal tipple was part of the Glasgow Railroad and was located on the west bank of Beaver Creek near Island Run. 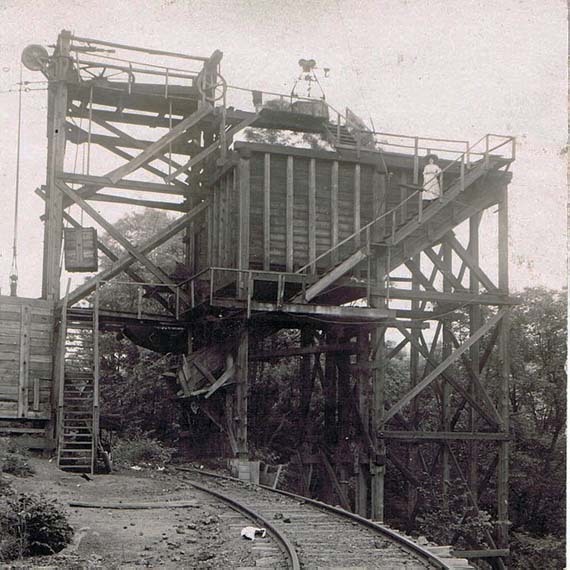 ( downstream from Grimm's Bridge) The sole purpose of the line was to obtain coal that was mined on the Pa. side and then transferred across the creek in suspended buckets to the tipple. The coal was used to generate electricity for the streetcars. The Steubenville and EL Railway acquired the short line in 1908. The so-called Island Run electric line was used until 1917 when C.A. Smith found that he could purchase cheaper power downriver. 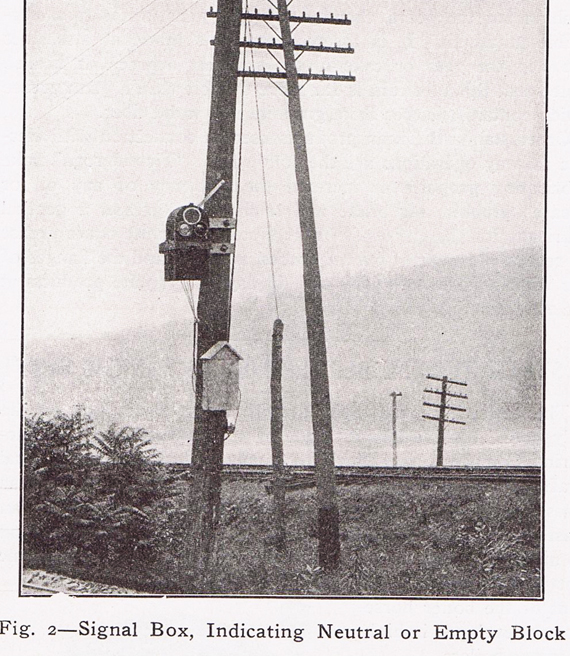 They mined the coal on the Pa. side of Beaver Creek and transported it on a 1500 foot cable system to the tipple. You can make out one of the buckets at the top. 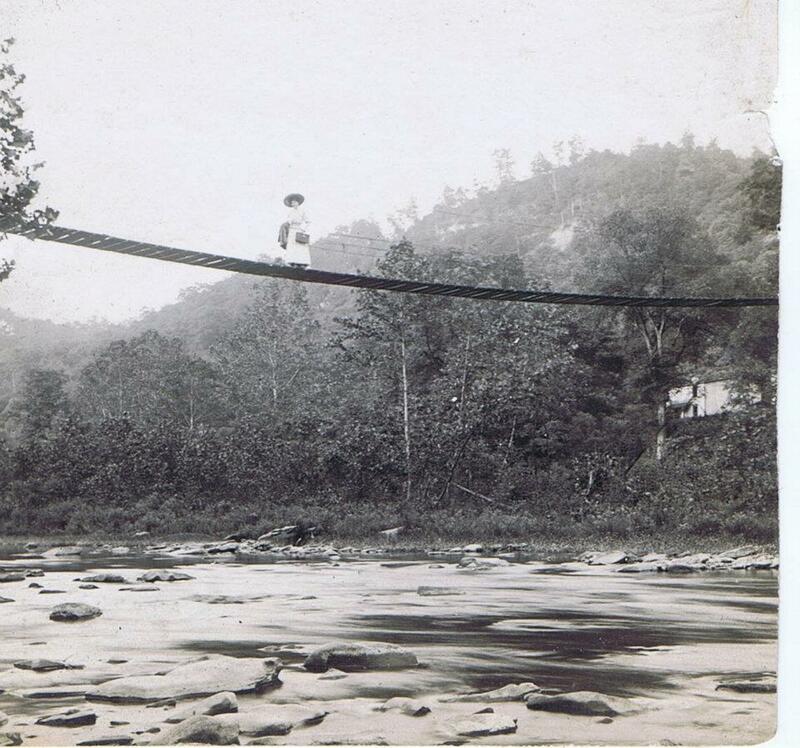 The woman on the coal Tipple is Indiaold Shurte Porter (1890-1931) Information provided by Attorney Timothy R. Brookes, President of the East Liverpool Historical Society. Indiaold Shurte Porter was the great aunt of Attorney Brookes. 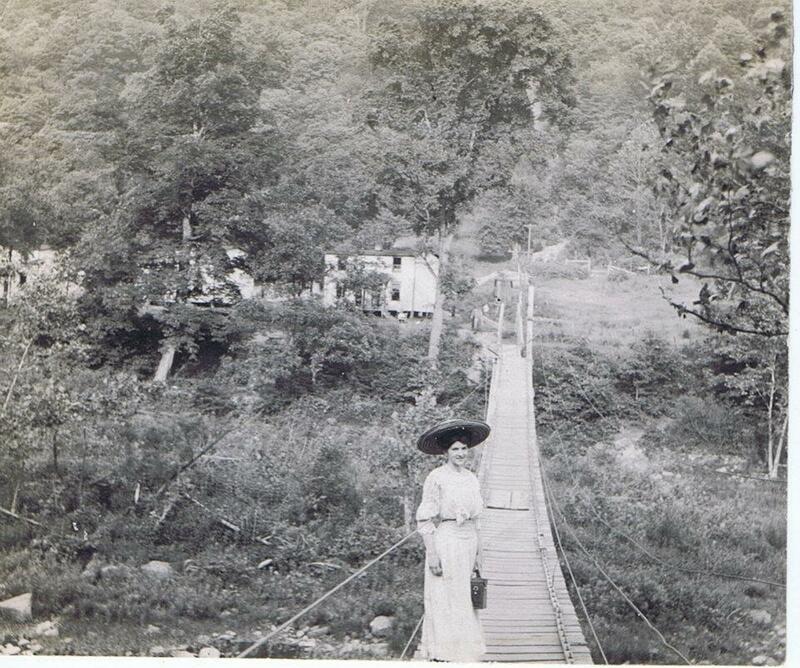 The above two pictures showing Indiaold Shurte Porter the footbridge to the Island Run Company homes on the west bank of Little Beaver Creek. Pictures from the Brookes Collection, text from Ghost Rails III, Electrics by Wayne A. Cole. p 181. Contributed by Linda and Chip Zelch. We thank them both. We thank Charlie Bowyer for the above information. October 8, 1910 Electric Railway Journal. Among improvements in electric railway equipment in the last few years none has been so marked perhaps as in automatic signals. These have advanced from the crude and dangerous hand- light signals, which have been the undisputed cause of accidents, to high-speed automatic signals dependent only on the passage of the car and requiring nothing further on the part of the motorman than observation. Among signals of the latter type are those made by the Naehod Signal Con, pany, Philadelphia, Pa. In the Nachod automatic signal type 'C' the signal box containing the indications is located in advance of the trolley contactor so that the motorman sees by the change of this signal that he has set stop signals at the far end of the block. The control of the signals is through overhead trolley contactors and all changes in indications are caused at the instant when the car runs under them. The signals are successfully and continuously worked at car speeds of 40 mph. and over in passing the contactors. If the power should leave the line while the car is in the block the signals would not have been changed when it returns, but would reappear exactly as before the interruption. A set of these signals to protect one block of signal track consists of two signal boxes mounted on poles and four trolley contactors in the wire in the branches leading to the single track. There is required but one line wire connecting the boxes. The trolley contactors consist of contact strips mounted near the wire, but insulated therefrom and extremely flexible so that they make a certain and continuous contact throughout their length without jarring or throwing the wheel. They are 4 ft. long, weigh only about 18 lb., and accommodate the various sizes of wheels equally well. The signal aspect is in duplicate, as there are separate night and day indications, white for "proceed" and red for "stop." 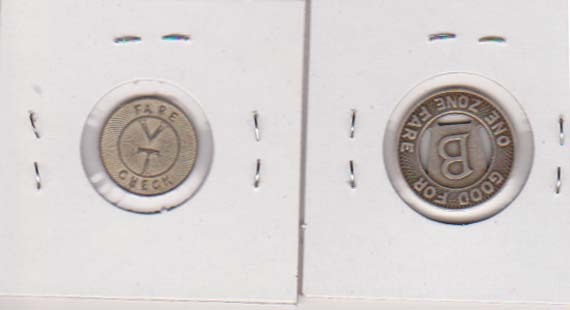 The night indications are lights; the day indications are enameled aluminum disks counterweighted to fall to the indicating position. They are protected from the weather and are visible through a clear glass roundel. The moving parts of the signal forming the relay are immersed in an oil tank below the aspect. Thus both the magnets and switches receive the benefit of oil immersion. On the Chicago & Milwaukee Electric Railroad these signals are used in a service where three-car trains with three trolleys up pass through the block at 40 mph. 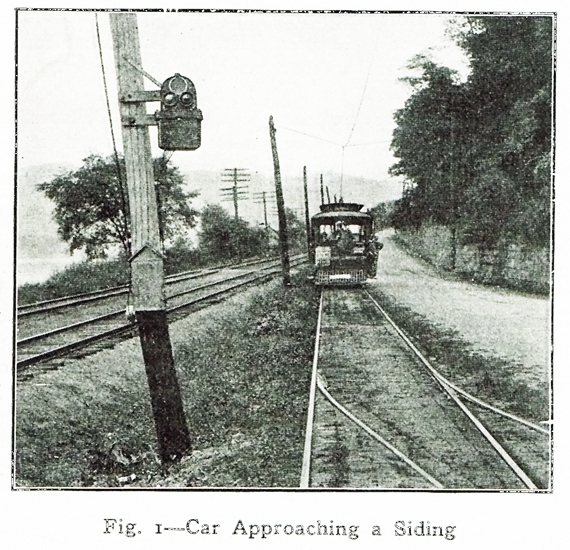 The accompanying illustrations show signals on the line of the Steubenville & East Liverpool Railway & Light Company (Ohio Valley Scenic Route), of which W. R. W. Griffin is general manager. In Fig. 1 the car is approaching the observer to leave the block, the signal being set red. As soon as it passes the contactor at this end of the block the signals will be restored to normal or neutral. Fig. 2 shows a signal box indicating neutral or a void, which means that the block is unoccupied and may be taken from either end. A car entering from the end shown will set white signal here and red at the far end. The signals are arranged for permissive operation that is, cars may follow into the block, but until they have all left they will not be restored to the neutral indication. The system has the desirable flexibility which enables cars having entered to leave the block by either end. The leads from the line before entering the signal box pass through the wooden box below shown in the figure. This box is provided with enclosed fuses which act also as disconnecting switches when the signal box is to be handled. A lightning arrester is attached below this box.